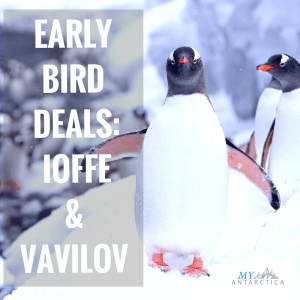 There’s never been a better time to make your Antarctica dreams a reality with the early bird offers on the Vavilov Voyager and Ioffe Navigator Antarctic cruises. Polar travellers can save up to US$1500 on a range of expedition cruises travelling to the Antarctic Peninsula, South Georgia, Falkland Islands, the Polar Circle or Weddell Sea. The Ioffe Navigator and Vavilov Voyager are specialist research vessels designed for polar cruising and accommodate 96 and 92 guests respectively. You can choose from cruise programs starting in Ushuaia, Argentina or combination fly cruise programs starting in Punta Arenas in Chile. Book on a voyage departing in October, your cabin departing in October & November in 2018 or March in 2019 and you can save US$1500 per person. Book on a voyage departing in November & December 2018 and January 2019 and you will save US$1000 per person. As well as an in depth cruising experience including daily landings in Antarctica, lecture programs, zodiac excursion plus meals, every person travelling on the Ioffe Navigator or Vavilov Voyager also get US$900 worth of polar gear to use on their journey for free. Bookings and highly subject to availability and must to booked and deposited by 30 September 2017. Cruise rates start from US$8,695 pp in a triple share basis.